It's become trendy to release your album in more than one part these days. 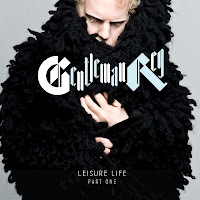 Toronto's Gentleman Reg is the latest to jump on board as he releases his new album Leisure Life as three EPs. The first came out this week. Now I've personally had a difficult time embracing Reg. There's just something about his persona that I find off-putting. From what I've heard on part one of Leisure Life I may very well be able to overlook that. On the lead single, "Waiting Around for Gold", Reg's underpowered vocals put the focus where it belongs: on the fun keyboard swirl and slick hook. Showing he's adept at that style, he offers an infectiously percolating rhythm on "I Could Be What You Wanted". Reg takes a slightly different approach to "Driving the Truth". The song builds slowly, until it eventually lives up to its title, careening like an out-of-control sportscar down the highway. Rounding things out is "Solo Shows". The song is subdued compared to the rest of the record. It's also the most elegant and melodic offering here. Five tracks into the full release of Leisure Life and there isn't a weak song yet. If Gentleman Reg can deliver at this level on the next two EPs, he'll have at least one convert. Best tracks: "Waiting Around for Gold", "I Could Be What You Wanted"